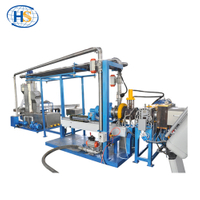 Hotspots in the Development of Modified Plastics - Nanjing Haisi Extrusion Equipment Co., Ltd. 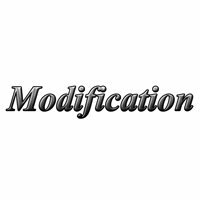 The modified plastics are plastic products with specific properties processed or modified by physical, chemical or mechanical methods to improve the properties of the resins in terms of flame retardancy, aging resistance, mechanical properties and electrical, magnetic, optical and thermal properties. On the basis of engineering of general plastics and high performance of engineering plastics, nanotechnology, condensed matter physics, energy conservation and environmental protection are introduced into the production process of modified plastics, which makes the application of plastic products further increase in scope and depth. Modified plastics are a favorable means to save petroleum resources, reduce production costs and increase economic benefits. Their applications cover traditional industries such as office equipment, household appliances, electronic and electrical industries and rail transit, precision instruments, aerospace, new energy and other high-tech areas. Although modified plastics can be achieved in many ways, the most widely used processes are still filled in plastics or compacted with alloy materials. The production process mainly involves long glass fiber reinforcement technology, blending and alloying technology and nanotechnology. Glass fiber reinforcement technology is to incorporate glass fiber into plastics, so as to gain advantages over common metals in strength, toughness, weight, price and so on. The long-glass fiber reinforcement technology is mainly applied to the development of the automobile, and the obtained high-performance modified plastic can replace some mechanical parts on the automobile, so that the automobile can obtain the lighter weight and better cost performance under the condition of meeting certain strength and using conditions. Blending and alloying technology refers to mixing two or more kinds of polymers in a certain proportion and then alloying them by chemical and physical methods. The modified plastics obtained by this technology tend to be greatly improved in the aspects of processing property, mechanical property, heat resistance, flame resistance and the like, and is one of the most active varieties in the plastic industry, and is widely used in the fields of precision instruments, office equipment, packaging materials, building materials and the like. As a new subject in recent years, the application of nanotechnology has produced nano-composite technology modified plastics, and has become a hot spot in the plastic industry. Filling and nanotechnology refers to the special treatment of fillers, so that the nano-materials added into resin can exist stably and uniformly. Nanotechnology can not only help plastic products have stronger toughness and mechanical properties, but also give new properties to plastics and broaden the application field of plastics. For example, various nano-inorganic powder materials modified plastics has outstanding anti-aging. Plastic pollution has always been a difficult problem in environmental management. It is difficult to degrade in nature, so it exists in soil for a long time. When the waste plastic in the soil exceeds the self-purification ability of the soil, the composition, structure and function of the soil will change, and the health of human will be damaged by plants or water. 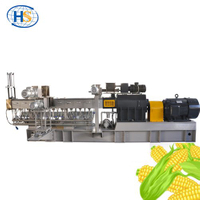 Nowadays, the concept of environmental protection is popular, starch plastics, degradable plastics and other green environmental protection modified plastics products become a new hot spot. 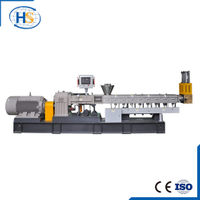 Any interest in plastic modification extruder, please feel free to contact us!